Diluted earnings per share was 21 cents, a 4.5 percent decrease from the first quarter of 2015 and unchanged from the second quarter of 2014. Net interest income decreased $661,000, or 0.5 percent, compared to the first quarter of 2015 and decreased $5.0 million, or 3.9%, compared to the second quarter of 2014. The net interest margin decreased 7 basis points compared to the first quarter of 2015, to 3.20 percent. 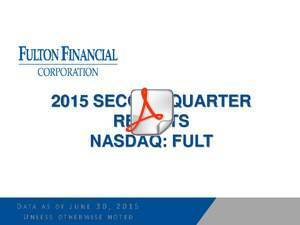 The net interest margin for the second quarter of 2014 was 3.41 percent. Average loans increased $97.1 million, or 0.7 percent, compared to the first quarter of 2015 and $396.9 million, or 3.1 percent, compared to the second quarter of 2014. Average deposits increased $107.1 million, or 0.8 percent, compared to the first quarter of 2015 and $878.6 million, or 7.0 percent, compared to the second quarter of 2014. The provision for credit losses was $2.2 million, compared to a $3.7 million negative provision in the first quarter of 2015 and a $3.5 million provision in the second quarter of 2014. Non-interest income, excluding investment securities gains, increased $3.5 million, or 8.6 percent, in comparison to the first quarter of 2015, and increased $314,000, or 0.7 percent, in comparison to the second quarter of 2014. Non-interest expense was largely unchanged compared to the first quarter of 2015 and increased $2.2 million, or 1.9 percent, compared to the second quarter of 2014. In April 2015, the Corporation announced that its Board of Directors approved the repurchase of up to $50 million of the Corporation's common stock through December 31, 2015. During the second quarter of 2015, 1.5 million shares were repurchased under this program at a total cost of $19.0 million. In June 2015, the Corporation issued $150.0 million of subordinated debt, the net proceeds of which were used to redeem $150 million of trust preferred securities in July 2015. Fulton Financial Corporation (NASDAQ: FULT) reported net income of $36.7 million, or 21 cents per diluted share, for the second quarter of 2015, compared to $40.0 million, or 22 cents per diluted share, for the first quarter of 2015. "We reported diluted earnings per share of 21 cents for the second quarter. During the quarter, we saw earning asset and core deposit growth, an increase in non-interest income across a number of key business lines and good control of other expenses," said E. Philip Wenger, Chairman, President and CEO. "Lower yields on earning assets exerted pressure on our net interest margin during the quarter. In keeping with our goal of creating shareholder value, and in light of the current low interest rate environment, we took steps to reduce interest expense over the long term through the issuance of $150 million in subordinated debt which was used to redeem higher cost trust preferred securities in July." Net interest income for the second quarter of 2015 decreased $661,000, or 0.5 percent, from the first quarter of 2015. Net interest margin decreased seven basis points, or 2.1 percent, to 3.20 percent in the second quarter of 2015 from 3.27 percent in the first quarter of 2015. Average yields on interest-earning assets decreased nine basis points, while the average cost of interest-bearing liabilities decreased three basis points during the second quarter of 2015 in comparison to the first quarter of 2015. Total average assets for the second quarter of 2015 were $17.2 billion, an increase of $85.0 million from the first quarter of 2015. Average loans, net of unearned income, increased $97.1 million, or 0.7 percent, in comparison to the first quarter of 2015. Non-performing assets were $162.3 million, or 0.93 percent of total assets, at June 30, 2015, compared to $163.5 million, or 0.94 percent of total assets, at March 31, 2015 and $162.8 million, or 0.96 percent of total assets, at June 30, 2014. Annualized net charge-offs for the quarter ended June 30, 2015 were 0.38 percent of total average loans, compared to 0.08 percent for the quarter ended March 31, 2015 and 0.28 percent for the quarter ended June 30, 2014. The increase in net charge-offs was mainly in commercial loans and was primarily due to two customer relationships that were placed on non-accrual status in the first quarter of 2015. The allowance for credit losses as a percentage of non-performing loans was 113.3 percent at June 30, 2015, as compared to 120.3 percent at March 31, 2015 and 129.6 percent at June 30, 2014. During the second quarter of 2015, the Corporation recorded a $2.2 million provision for credits losses, compared to a $3.7 million negative provision for credit losses in the first quarter of 2015. The $5.9 million increase in the provision resulted from the consistent application of the Corporation's allowance methodology. Non-interest income, excluding investment securities gains, increased $3.5 million, or 8.6 percent, in comparison to the first quarter of 2015. Service charges on deposit accounts increased $1.1 million, or 9.2 percent, primarily due to an increase in overdraft fees. Other service charges and fees increased $1.6 million, or 17.4 percent, primarily due to increases in debit card, merchant and commercial loan swap fee income. Mortgage banking income increased $650,000, or 13.9 percent, mainly due to an increase in spreads on new loan commitments. Gains on sales of investment securities decreased $1.7 million in comparison to the first quarter of 2015. Gains in the second quarter of 2015 were primarily realized gains on sales of equity securities. Non-interest expense decreased $124,000, or 0.1 percent, in the second quarter of 2015, compared to the first quarter of 2015. Occupancy expense decreased $1.9 million, or 13.8 percent, due primarily to seasonal fluctuations in snow removal and utilities costs. Other real estate owned (OREO) and repossession expense decreased $1.2 million, primarily due to an increase in net gains on sales of OREO. Partially offsetting these decreases was a $2.4 million, or 41.3 percent, increase in other outside services expenses. During the first six months of 2015, the Corporation implemented several cost savings initiatives, including the consolidation of nine branches, the modification of certain retirement benefits and the elimination of certain positions. Annualized expense reductions from these cost savings initiatives are expected to be approximately $6.5 million. Implementation expenses associated with these initiatives were $520,000 and $1.5 million during the second and first quarters of 2015, respectively. A discussion of certain risks and uncertainties affecting the Corporation, and some of the factors that could cause the Corporation's actual results to differ materially from those described in the forward-looking statements, can be found in the sections entitled "Risk Factors" and "Management's Discussion and Analysis of Financial Condition and Results of Operations" in the Corporation's Annual Report on Form 10-K for the year ended December 31, 2014 and Quarterly Report on Form 10-Q for the quarter ended March 31, 2015, which have been filed with the Securities and Exchange Commission and is available in the Investor Relations section of the Corporation's website (www.fult.com) and on the Securities and Exchange Commission's website (www.sec.gov). The Corporation undertakes no obligation, other than as required by law, to update or revise any forward-looking statements, whether as a result of new information, future events or otherwise.